This is a great shot of a beautiful car and it's silver clad fashion accessory. The Porsche Tapiro was designed in 1970 by Giorgetto Giugiaro of Ital Design. 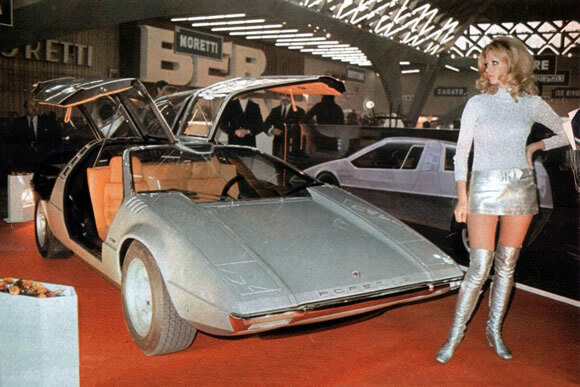 Based on the Porsche 914/6 platform, a favourite of mine, it was reportedly one of Guigiaro's favourite designs. The Tapiro had a mid mounted 2.4 litre flat 6 cylinder Porsche engine with 220 bhp. Not bad for a fairly small, light-weight car. Check out some great pics here of the gullwing doors and initial design. Very cool.